This facility is open to the public for item disposal. 7 a.m. to 4 p.m. Yard Waste will be accepted until 5 p.m. Learn how to properly dispose of your item using the Waste Wizard. Fill out a Waste Origin and Disposal form prior to entering the landfill. Review the Payment and Accounts Billing Options. There is a $8.00 minimum charge at the scale house. *No loads from outside of Atlantic County. Hazardous waste is only accepted from homeowners on scheduled dates. Click here for details. 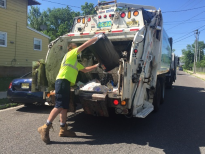 On August 10, 2012 the NJ Department of Environmental Protection (NJDEP) certified the Waste Flow amendment passed by the Atlantic County Freeholders on February 28, 2012. Click here to view the certification.